Bowen, C. (1998). Ages and Stages Summary: Language Development 0-5 years. Retrieved from http://www.speech-language-therapy.com/ on [insert the date that you retrieved the file here]. They listen to the speech of those close to them, and startle or cry if there is an unexpected noise. Loud noises wake them, and they become "still" in response to new sounds. Then, some time between 4 to 6 months babies respond to the word "no". They are also responsive to changes in your tone of voice, and to sounds other than speech. For example, they can be fascinated by toys and other objects that make sounds, enjoy music and rhythm, and look in an interested or apprehensive way for the source of all sorts of new sounds such as the toaster, birdsong, the clip-clop of horses' hooves or the whirr of machines. The 7 to 12 months timeframe is exciting and fun as the baby now obviously listens when spoken to, turns and looks at your face when called by name, and discovers the fun of games like: "round and round the garden", "peep-oh", "I see" and "pat-a-cake" (These simple games and finger plays have regional names and variants). It is in this period that you realise that he or she recognises the names of familiar objects ("Daddy", "car", "eyes", "phone", "key") and begins to respond to requests ("Give it to Granny") and questions ("More juice?"). He or she can also follow simple commands ("Push the bus! ", "Don't touch; it's hot!") and understand simple questions ("Where's the bunny? ", "Who likes Miffy? ", "What's in your purse?"). 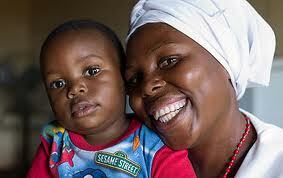 Your toddler now likes listening to simple stories and enjoys it when you sing songs or say rhymes. This is a stage in which he or she will want the same story, rhyme or game repeated many times. By now your toddler will understand two stage commands ("Get your socks and put them in the basket") and understand contrasting concepts or meanings like hot / cold, stop / go, in / on and nice / yuccy. He or she notices sounds like the telephone or doorbell ringing and may point or become excited, get you to answer, or attempt to answer themselves. Your three or four year old understands simple "Who? ", "What?" and "Where?" questions, and can hear you when you call from another room. This is an age where hearing difficulties may become evident. If you are in doubt about your child's hearing, see a clinical audiologist. Children in this age range enjoy stories and can answer simple questions about them. He or she hears and understands nearly everything that is said (within reason) at home or at pre-school or day care. Your child's ability to hear properly all the time should not be in doubt. If you are in doubt about your child's hearing, see a clinical audiologist. If you are in doubt about language comprehension, see a speech-language pathologist / speech and language therapist. Your baby smiles at you when you come into view. He or she repeats the same sound a lot and "coos and goos" when content. Cries "differentiate". That means, the baby uses a different cry for different situations. For example, one cry says "I'm hungry" and another says "I have a pain". Gurgling sounds or "vocal play" occur while you are playing with your baby or when they are occupying themselves happily. 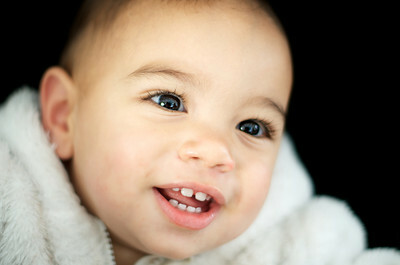 Babbling really gets going in this age range, and your baby will sometimes sound as though he or she is "talking". This "speech-like" babbling includes many sounds including the bilabial (two lip) sounds "p", "b", "w" and "m". Your baby can tell you, using sounds or gestures that they want something, or want you to do something. He or she can make very "urgent" noises to spur you into action. Now your baby is accumulating more words as each month passes. He or she will even ask 2-word questions like "Where ball?" "What's that?" "More chippies?" "What that? ", and combine two words in other ways to make the Stage 1 Sentence Types ("Birdie go", "No doggie", "More push"). Words are becoming clearer as more initial consonants are used. Your two or three year old's vocabulary is exploding! He or she seems to have a word for almost everything. Utterances are usually one, two or three words long and family members can usually understand them. Your toddler may ask for, or draw your attention to something by naming it ("Elephant") or one of its attributes ("Big!") or by commenting ("Wow!"). Sentences are becoming longer as your child can combine four or more words. He or she talks about things that have happened away from home, and is interested in talking about pre-school, friends, outings and interesting experiences. Speech is usually fluent and clear and "other people" can understand what your child is saying most of the time. In fact, sometimes "other people" hear things you wish they had not! Little Sister (3): It’s not fair mummy, my nose won’t blow. Big Brother (4): Why won’t Fissy’s nose blow, mummy? My nose is a snot factory. If stuttering (also called stammering) occurs, see a speech-language pathologist. Stuttering is not a normal part of learning to talk, and neither is persistent hoarseness. Your child speaks clearly and fluently in an easy-to-listen-to voice. He or she can construct long and detailed sentences ("We went to the zoo but we had to come home early because Sally wasn't feeling well"; "I want to have a horse of my own like Evan, and Daddy says when he wins the lottery he'll buy me one."). He or she can tell a long, involved imaginative story sticking to the topic, and using "adult-like" grammar. Most sounds are pronounced correctly, though he or she may be lisping as a four year old, or, at five, still have difficulty with "r", "v" and "th". Your child can communicate easily with familiar adults and with other children. Your child may tell fantastic, dramatic, inventive, "tall stories" (sometimes even scaring themselves!) and engage strangers in conversation when you are out together.